Sometimes working in the wedding industry means that I catch myself saying stupid things like, “I’m SO glad color is back!” But let’s be real. I’m so glad color is back. 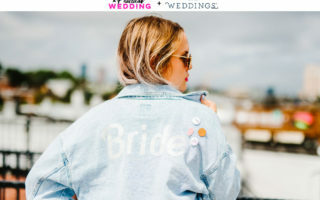 After what feels like half a decade of pastels, the wedding industry is finally embracing a little edge again, and I’m seeing a ton of bright colors and bold designs in the weddings I’m shooting this year. Wedding industry, I’m with you on this one. Yes, even the neon parts. Hell, especially the neon parts. When we teamed up with Natalie from Belle-Flower in Emeryville for this How-To series (SF Bay Area, you go get her), our number one goal (other than inciting rage over grocery store cakes) was to demystify the oversized bouquet. Because oversized bouquets are awesome. And it turns out? Not that complicated to make, if you know the right ingredients and the right technique for building a bouquet. You can adjust your quantities to taste, but our final spread ended up being about 4 peonies, 4–5 garden roses, 2–3 bunches of green hydrangea, 2 stalks of decorative kale, 5–7 billy balls, and then a handful of fern, eucalyptus, and hanging amaranthus (enough to add volume, based on personal taste). First, remove all of the foliage from the stems of your flowers. Then add hydrangeas, kale, garden roses to build up your base. This is where I always get lost when doing floral arrangement (i.e., when I buy flowers from Trader Joe’s and try to make them look pretty in my house). The secret is to add them in small clusters so that the bouquet looks balanced (so if you add two roses on one side, then add one rose on the other side to balance it out) and concentrate on making the shape round as you go, pulling the stems up to create fullness. Gently wrap floral tape around the stems of your base, keeping it loose enough that you can still add additional stems. Next, add some eucalyptus and fern to outside of your base. We then stuck a few billy balls into the center of our bouquet. If you’re adding flowers to the center of your bouquet after you’ve taped it together, don’t try to fit the new stems inside the taped ones. It’s better to put them on the outside. Add hanging amaranthus to the cascading side of your bouquet, then place a few more big flowers along the outside of your arrangement. When the bouquet starts to get heavy in your hand, do another tape wrap. To add this tape, hold the stems together tight and wrap the tape as tight as you can go, up as far as you can go on the stems (higher and tighter than your last tape, which you’re going to remove). Then remove the old tape. At this point, you want to clean up. Find where flowers have gotten hidden, look underneath the bouquet to locate its stem, and then just push the flower up so that it “comes back into the circle.” Add more filler to the hanging side. Then tip your bouquet upside down and do a final taping. Cut all your stems to the same length, making sure they are at least long enough to hold with two hands. Time for ribbon! 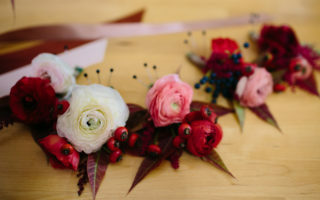 You need corsage pins or boutonniere pins. For this one we used small black boutonniere pins (one for the top and one for the bottom). Make sure to measure your ribbon to be more than you think you need. Then, starting at the top, hold the ribbon with your thumb, then take your pin and shove it up inside one of the stems to hold it in place. This anchors the ribbon so that you can wrap. Next wrap as far down as you want (there’s no rule here, just personal aesthetics) and anchor the bottom with a pin the same way you did at the top. It’s fine if your stems to look a little crazy while you’re building. You should be adding things diagonally, so a little crazy is actually a good thing. It means you’re doing it right. As you add each new layer to your bouquet (building out from the base) you’re going to notice gaps. That’s perfectly fine. Just fill the gaps in as you go, minding the overall balance of the bouquet and keeping the cluster rule in mind. The essence of a bouquet is always round/circular. The way you add interest and variety is by poking things up for height or drooping them down. So have fun with this one, guys. Play around with the recipes Natalie gave us (send pictures?!). And rejoice in the fact that the trend of the moment is big, bold, imperfection. Because if I can do it, so can you.